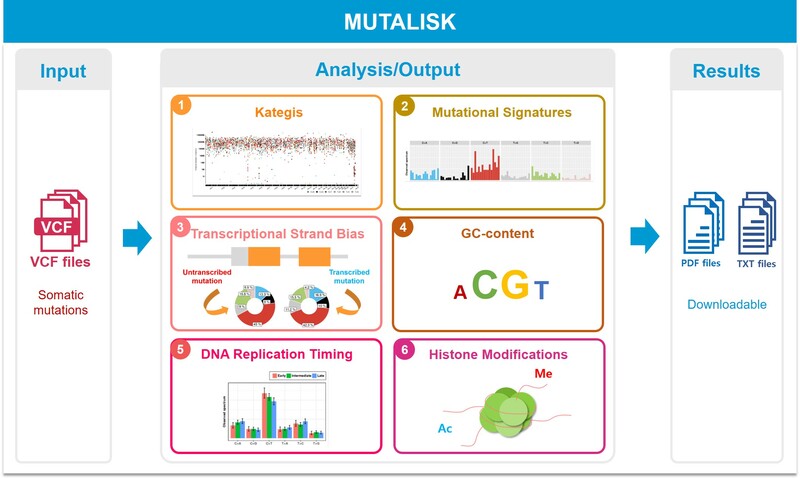 Mutalisk is a free and public web service program that enables comprehensive analysis of somatic DNA mutations with genome regulation elements and DNA sequence contexts. Somatic DNA mutations are consequences of various non-random biological processes in somatic cells such as DNA repair and other endogenous/exogenous mutational processes. These mutations are not uniformly distributed genome-wide, but enriched in certain genomic loci, specific DNA sequence, and/or epigenome contexts according to the mutational processes. Lee J., Lee A.J., Lee JK., et al. Mutalisk: a web-based somatic MUTation AnaLysIS toolKit for genomic, transcriptional and epigenomic signatures, Nucleic Acids Research, gky406, 2018. Alexandrov LB, Nik-Zainal S, Wedge DC, Aparicio SA, Behjati S, Biankin AV, et al. Signatures of mutational processes in human cancer. Nature. 2013;500:415-21. Nik-Zainal S, Alexandrov LB, Wedge DC, Van Loo P, Greenman CD, Raine K, et al. Mutational processes molding the genomes of 21 breast cancers. Cell. 2012;149:979-93. Schuster-Bockler B, Lehner B. Chromatin organization is a major influence on regional mutation rates in human cancer cells. Nature. 2012;488:504-7. Nik-Zainal S, Davies H, Staaf J, Ramakrishna M, Glodzik D, Zou X, et al. Landscape of somatic mutations in 560 breast cancer whole-genome sequences. Nature. 2016;534:47-54. Pleasance ED, Cheetham RK, Stephens PJ, McBride DJ, Humphray SJ, Greenman CD, et al. A comprehensive catalogue of somatic mutations from a human cancer genome. Nature. 2010;463:191-6.